How can prenatal testing help your patients? In utero diagnosis has undergone an amazing revolution in recent years. More tests are available; the indications for prenatal diagnosis have expanded - you can now advise your patients about disorders you could not have previously detected. Medical training for obstetricians, medical geneticists, and genetic counselors has not kept pace with these developments. Clinical exposure to common and unusual problems in prenatal diagnosis is limited. 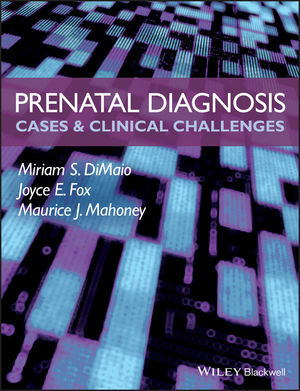 Prenatal Diagnosis: Clinical Cases and Challenges, based on the authors’ several decades of experiences, fills this gap. Real cases portray diagnostic problems as a route to the underlying biology, the available testing options, and the results that might be obtained. The authors discuss the challenges of management, interpretation, and counseling. The decision to enter the world of prenatal diagnosis should be very carefully considered by any prospective mother. Prenatal Diagnosis: Clinical Cases and Challenges will help you discuss the issues in an informed manner with your patients. Common aneuploidy – recurrence risks and counseling pitfalls. Chromosomal mosaicism – prenatal diagnosis. Chromosomal mosaicism – postnatal diagnosis. Reciprocal translocations and structural abnormalities. Chapter 2 Introduction to Mendelian Disorders. Chapter 3 Autosomal Dominant Disorders. Features of autosomal dominant inheritance. Chapter 4 Autosomal Recessive Disorders. Features of autosomal recessive inheritance. Chapter 8 Abnormal Ultrasound Findings. Chapter 11 First and Second Trimester Screening Tests.